Members of the Greater Houston chapter of Associated Builders and Contractors (ABC)  met Friday to learn from a panel of construction leaders how the industry has evolved over the years and discuss free enterprise challenges that lie ahead for the merit-shop construction industry regarding labor unions, regulations, PLAs, workforce shortages, worker misclassification, and immigration policy. 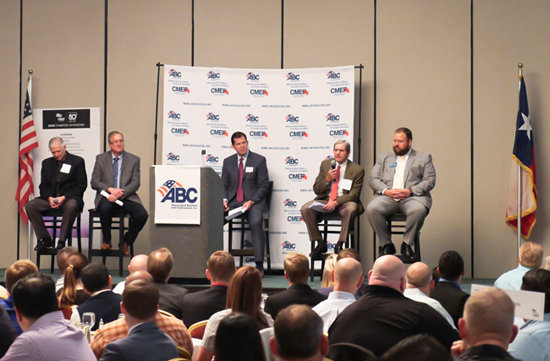 Brandon Mabile, Chairman of the board for ABC Houston and business development manager for Performance Contractors , preluded the panel discussion by stating ABC Houston’s missions in advocating for legislative policies that support the merit shop construction industry. “In Austin the session has begun, and we have some bills we’d very much like to get passed to continue to preserve free enterprise and our right to do business in a way we see fit…One of our biggest priorities this year is the fair and open compensation act, which would guarantee that government contracts cannot include mandatory PLAs,” he said. Mabile also spoke to the importance of the organization and its members investing in the education and training of current and future workers. 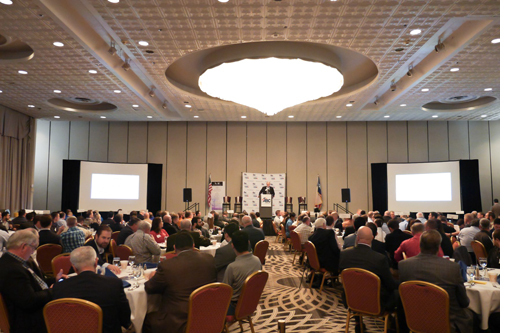 He mentioned that CMEF , the educational affiliate of ABC Houston devoted to workforce development, will double its number of students this year. Additionally, Mabile stressed the need to improve safety across the industry, encouraging all of ABC’s members to participate in the organization’s Safety Training and Evaluation Program  (STEP) . “As we improve safety we’re going to improve workforce development and we’re going to improve our bottom line because a safe jobsite is a productive jobsite,” he said. Along with Brandon Mabile, the panel consisted of Roger Berry, President of Senior Living and Campus Housing Division for SpawGlass Construction ; John Golashesky, Senior Vice President and Regional Manager for Turner Industries ; and Stan Marek, CEO of MAREK . Ben Westcott, with Andrews Myers  and Chair of ABC Texas , moderated the panel and explained that the ABC Houston Chapter was started in 1969 by an Executive with Brown and Root after his company was targeted by the AFL-CIO. Marek also mentioned a new documentary video series called The Rational Middle of Immigration  that seeks to inform the general public, shape sensible policy solutions, and create a deeper understanding of immigration. “We want people to be educated about the rational middle of immigration so they can vote for people who think like they do. We’re also providing political cover for our politicians. It’s very important that we solve this immigration problem,” he said.